But now we’re back and although we only took a long weekend, it felt like we were gone for weeks. 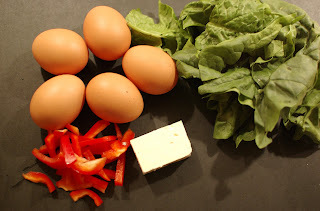 Since we didn’t have much in the house and didn’t want to make a huge run to the store, I decided to fall back on an early Hotplate Confidential standby – the frittata. There are so many options, almost any combination of veggie and cheese works. Tonight though, I had some feta and a pepper. Paired with spinach and a little parmesan on top, it made for a perfect Tuesday (although it feels like Monday) night meal. Because I don’t have an oven that can handle a frying pan with its long handle (believe me, I’ve tried! 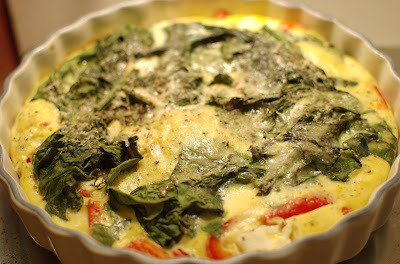 ), I’ve perfected a way of making frittatas that is essentially the same as making a quiche. No need to start on a stovetop and transfer to the oven – just stick the dish in and bake! Whisk together the eggs, milk, salt & pepper. Place the red pepper, spinach, and feta on the bottom of the pie dish (mine is 9 inches). Pour the egg mixture over the vegetables and cheese. Sprinkle the parmesan and more salt & pepper on top. Place in the oven for 25 minutes. The mixture should be completely set before you take it out of the oven.